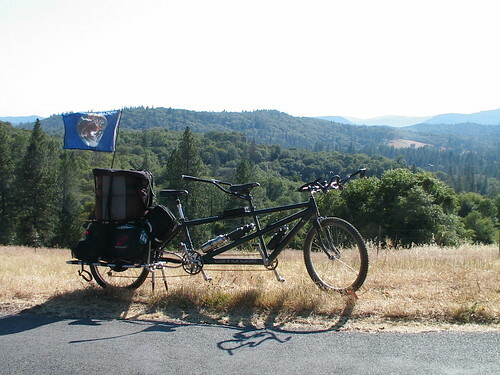 "Here is a pic of our Cannondale/xtracycle mountain tandem complete with camping gear, groceries, and a drumkit! What a blast! it has a 1000 watt Crystalyte 48 volt rear hub motor for up hill pedal assistance... Awesome bike! We love our xtracycle!" nice bike! Did I see this chained to a tree on the yuba river? I'm interested in building a bike like this for my household.. tandem, extracycle with rear hub motor!!! not to mention the greater stress placed on a bike by streatching the load that far. What are the dropout dimensions (O.L.D.) on your tandem? I know you need a 135mm O.L.D. for an xtracycle and most tandems are 145mm. Did you have a 135mm O.L.D. or did you do some special fitting?